This gradient cake is simply gorgeous, and the video of the making of it is even more so, don’t you think? I’ve found that many people hold shockingly strong opinions about fondant! Decorators seem to adore it and can’t imagine a cake without it, but foodies often eschew it. How do you feel about fondant? Too sweet or just right? Edible photos found on this mouth-watering post. so fun to work with, but a little too sweet. do you know if it’s used only in the states because it seems to be pretty unknown here in france and it’s not called fondant, but something else i can’t remember! pretty cake! Marzipan? at least I think that’s what we call it here in New Zealand. General fondant is called icing here in the UK – that’s the squishy Betty Crocker kind, but also the more solid sort in the above video. If it contains almonds, though, it’s called marzipan – it’s easier to make detailed cake decorating sculptures (e.g. Father Christmas or penguins to go on top of a festive cake) with this sort. And if someone said ‘fondant’ to me, I’d think they were talking about something sweet but liquid, perhaps a sort of icing glaze, but equally it could be melted chocolate and totally un-cake related. Isn’t it funny all the vocabulary differences we have between different varieties of English! Pretty to look at but yucky to eat. Love the video. Notice how she doesn’t even eat the fondant. I don’t care for it, but it does make a beautiful cake. if you notice…she wasn’t eating it either! I like using Massa Ticino, I guess that’s just like fondant? It is so easy to work with. Love this, we have a traditional cake recipe that we use for every family birthday but this one might need to be tried, love the idea of the rainbow chips! As I have little time now on the internet, I love your posts Gaby and thank you for your thoughtfulness that you put into each and every one! Pretty to look at, but not to taste. At least in my opinion. Although that’s probably why decorators love it and foodies don’t! wow! that cake is gorgeous. i’m actually not sure i’ve ever tried fondant, but i’ve certainly heard debates between people. seems like it’s beautiful, but not so tasty. Fondant is beautiful but gross. Totally gross. I concur. Buttercream completely trumps fondant, though fondant does so many sculpturally cool things on a cake. I want to be able to eat the whole thing! I think fondant is disgusting! Makes beautiful cakes, though! Gorgeous, but I think it tastes terrible. I’ve eaten far too many delicious looking wedding cakes only to gag on the chewy fondant. I wonder why we have such an obsession with making cakes that don’t actually look edible … or taste good! I really dislike eating fondant but think it looks amazing. I don’t have too much of a sweet tooth though so that may be why! In our family, buttercream tops fondant every time. Including wedding cakes! It may be pretty, but I’d much rather have something that tastes amazing! One more vote for looks pretty but taste and mouth feel are awful. Actually, can look pretty. Often times all the fondant froo-froos and colors end up making cakes look over-worked, busy and nothing at all like food. I can appreciate the technique, though, and some can be very lovely, like this one. I am always disappointed when I see a fondant cake at a wedding or other celebration. Sure, they might be neat to look at, but eeecchhh. A good creamy frosting wins out every single time. I agree with the others, and take it a step further. I don’t like frosting at all, so I’m accustomed to fondant, frosting, icing, whatever, being used as a visual aid, and nothing more. I like my cake, cupcakes, and even donuts completely plain. That’s where it’s at! I’ve never had one, but I’m not sure it matters because it looks so darn gorgeous! It’s great fun to work with and makes beautiful cakes but I think it ruins the flavor of the dessert. It tastes horrible. this is a great idea! and great video!! 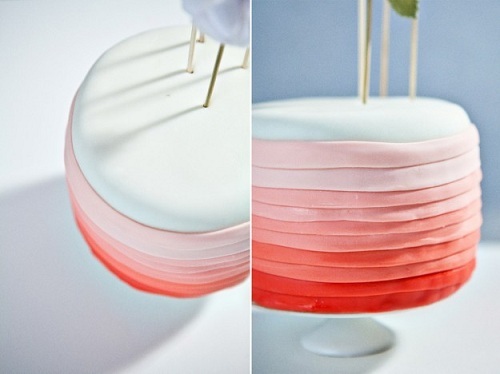 I love how this cake looks, ombre is so beautiful and so popular right now. I like the look of fondant but definitely prefer the taste of buttercream or better yet, cream cheese frosting! Looks like A LOT of work. Pretty though, but I also don’t like the taste. I’m a professional baker and love the look of fondant — and I’ll use it for super-specialized decoration, but I actually prefer a simple cake! this is gorgeous. i know it’d be a lot of work, but can you imagine a line of these in different colors? The cake is super sweet in design, but as with most fondant, probably too sweet to eat. As long as the cake underneath is yummy, I don’t mind. looks pretty but i am not a fan of fondant and definitely not a fan of food coloring! I’ve always liked the taste of fondant. This cake looks delicious to me! I made a similar cake to celebrate my daughters 1 month birthday, but the gradient of pink was on the inside. I am not a fondant fan. It looks amazing, but doesn’t taste that great to me nor my children. This cake is GORGEOUS but I’m not a fan on fondant. I like good ol’ fashion frosting. Fondants – hard to work with and gross to eat. Prefer buttercream. Wow! I’m impressed! I just have to try and make this. It looks gorgeous! I do agree with what others say. I don’t eat the fondant myself. Gorgeous cake, and lucky me, I like to eat fondant. Some is better than other, however, and I wish it were all marzipan! I hate the fondant that most folks use but there is a terrific one made with marshmallows and it is soooo tasty! I have used it several times, not quite as easy to work with but I want my cakes, cupcakes to taste and look good. I have made marzipan and it an ground almond candy that would be difficult to roll out and put on a cake. It is terrific to make small decorations with and tastes great! In Norway we use marzipan on cakes all the time! If you think it’s difficult to roll it out, you can buy it ready made as a thin sheet in a roll, perfect to cover a round cake with. But after a test run or two, most people are able to roll it out themselves :) I think for some elaborate cake decorations it might be easier to use fondant though, even if it doesn’t taste quite as yummy as the almond marzipan. I love to use fondant just strictly as “decorations” but would actually never eat it or expect my guest too. Team buttercream all the way! For my husband and I – buttercream was absolutely a must for our wedding! The person who invents a delicious fondant will go down in baking history. It’s as beautiful as it is awful-tasting. Actually, I went to a cousin’s wedding last year and she had small, individual cakes at everyone’s place. They were convered in fondant, which I’d planned to peel off. Everyone at the table was shocked to find that the fondant was delicious. I really should track down that baker and ger her secret. Beautiful video. I love videos that are inspiring to do something creative. So beautiful. Personally I love fondant on a cake. It makes everything look so polished and thought-out. It’s much too rich to actually eat but the cake inside (and usually a layer of buttercream between the two) is plenty enough to make up for that.